An icon of the West and a classic among western arms, the Colt Peacemaker was a force to be reckoned with in the lands West of the Appalachians. 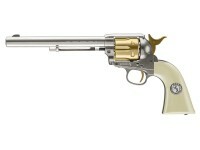 With this in mind, Umarex has created one of the most handsome replica Peacemakers ever produced. This 7.5” barreled Peacemaker really makes an impression upon opening the box. Its full-metal frame is not only sturdy, but shines with a nickel plated finish, all accented by a gold finished cylinder and hammer. Its mock ivory grips bear the emblem of its Colt namesake and includes the patent dates for the original .45 Peacemaker above the trigger--September 18th, 1871, July 2nd, 1972, and January 19th, 1975. As beautiful to shoot as it is to look at, load up the 6 included pellet shot shells to send them flying at speeds up to 380 fps—perfect for backyard plinking sessions with soda cans, balloons, or whatever you can dream up. Since this is single-action, you will pull its golden hammer with every shot. If you’re a lover of historic western firearms, or just love a great looking replica, look no further than the Colt Peacemaker. Things I liked: Really like this gun. 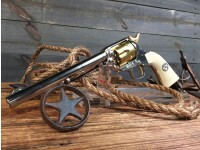 It's by far the best looking non engraved Peacemaker on the market. My only concern is how well the gold finish will last. Playing it safe and not planning on shooting this one much. It looks great next to my super blued John Wayne Colt. Things I liked: Its a great replica, fit and finish is nice, fun to shoot and reload. Things I liked: I do very much like this acquisition its very much true to the real Colt revolver in a word its beautiful. I do think price is a little high but I bought it anyway and I don't regret it. I have always been partial to both the calvary and the civilian models and I hope they make the later as well. I can't comment on its operation as I don't intend to ever use it. Things I would have changed: The price just a bit and I would like the hammer to completely close. How's the gold finish on this pistol? Does it rub off w/use? Planning on not shooting; just for display in my gun room. If you don't handle it, then it will never rub off. 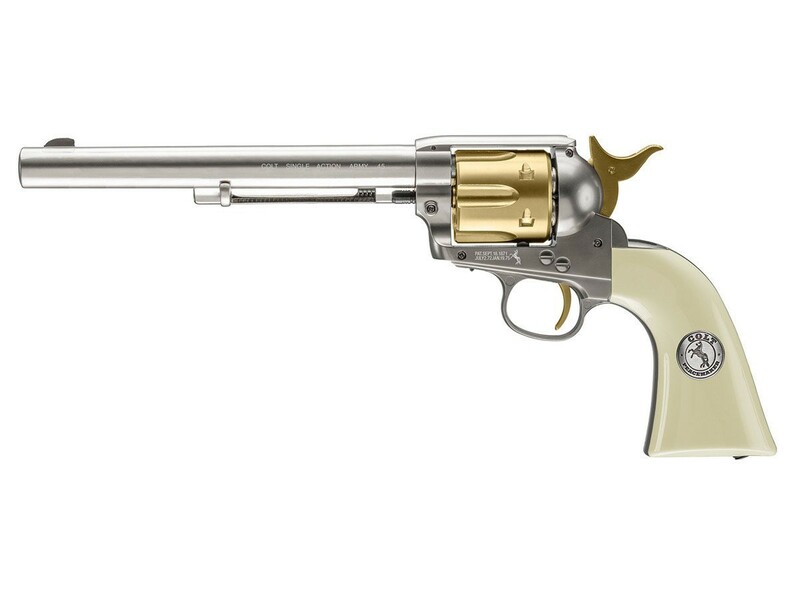 When will this model Colt Peacemaker be available with the standard 5 1/2" barrel? Perhaps a 3 1/2" barrel with birdhead grips...in real wood! Does this pistol have a rifled barrel....or is it a smooth bore?